The move to Carnegie in 2003 gave me two local stations, because the house was almost equidistant between them. 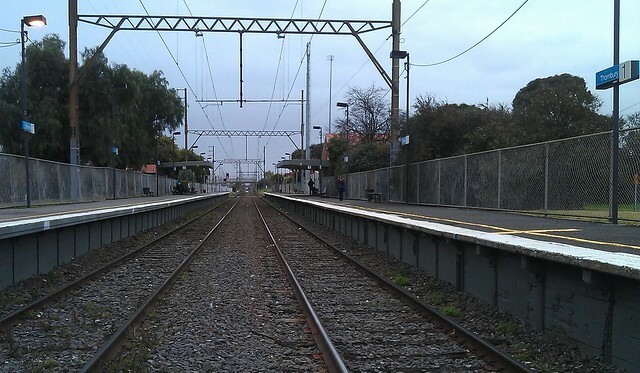 It was slightly closer to Murrumbeena, so I usually used that. But Carnegie had better access to shops, so that got used sometimes too. I’ve mentioned Murrumbeena already. Carnegie hasn’t changed much recently, but the surrounding area has, with the new library being built — and opening just after we’d moved away. D’oh. On the corner of Dandenong Road, a multi-level shopping centre rose from the (figurative) ashes of the old Betta Electrical/Billy Guyatts that was once there. I still sometimes go back to Carnegie. There’s a great pizza shop (“Herbs”) on the corner of Neerim and Koornang Roads. My final regular is Bentleigh. Since I moved here, it’s had upgrades to the level crossing (but not actual grade separation), and parts of the local Smartbus 703 route have been added into zone 1, which I think has added to the number of people using it. It’d be nice if this was all done in the name of removing zone anomalies, but in fact it appears the motivation was the Myki system, which needs stop zoning to be consistent between all the routes using an individual stop — so parts of the 703 had to be added to zone 1 to fit in with other routes around Brighton and East Bentleigh. No matter, at least it got done. Shame the 703 still doesn’t meet the Smartbus service standard. In the station itself, which isn’t exactly beautiful no matter how clean it is, there’s an ongoing battle of wills between Metro and local vandals, with the gents’ toilet door receiving many coats of paint in the past 12 months or so. Given the graffiti that decorates the ex-State Bank/Telstra store down the street, it’s fair to say there’s a local graffiti problem. 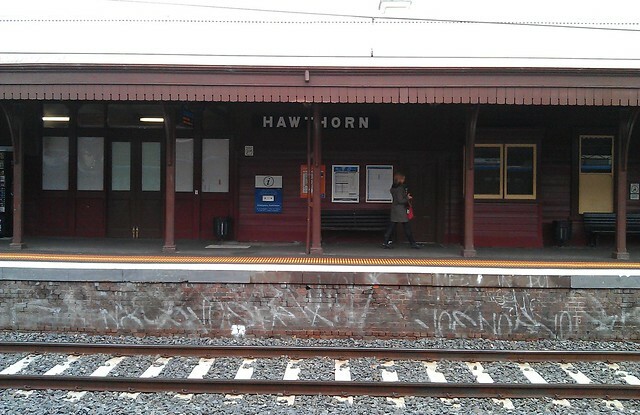 When I finally moved out of home, it was to Hawthorn. Initially I was still working in Burwood East, and the commute was an easy tram ride, from the flat we rented which was midway between there and the city — which became useful once work moved into town. Cutting through the back streets, it was about a 6-7 minute walk to the station (ditto at the other end to work in Collins Street). If there was a big gap in the trains (as there often was just after 6pm when coming home) the 70 tram was almost as quick as the train. The commute got a tad more complex when I changed jobs to St Kilda Road, and met the perils of the peak hour St Kilda Road tram crush — yes, even back then. To the untrained eye, Hawthorn has changed very little since then. You see it in television adverts every now and again, and I’m not surprised to see it’s heritage listed. 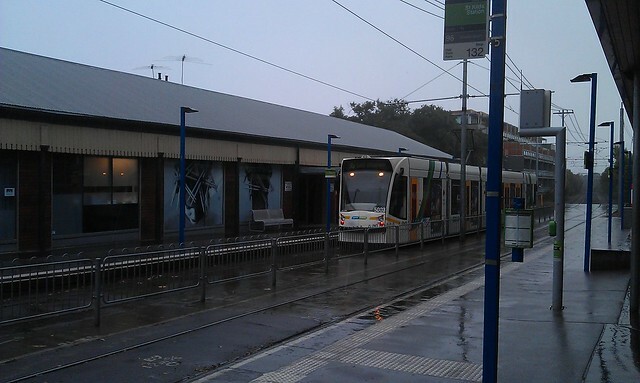 Moving into a flat in Booran Road, Glen Huntly, and living without a car meant it was a mix of tram and train travel. The usual work trip became either a tram ride on the 67 into St Kilda Road, or a train to South Yarra then a walk along Toorak Road (which was often faster than the cars) and across Fawkner Park, which was nice at least on a sunny day. Later jobs changed that, and for a while I was catching the train to Richmond, changing onto a train to Box Hill, then a bus to Doncaster… which is what finally prompted the purchase of a car. After that was a job in Brighton, which sometimes involved driving, and other times involved a tram to Elsternwick then a train to North Brighton. 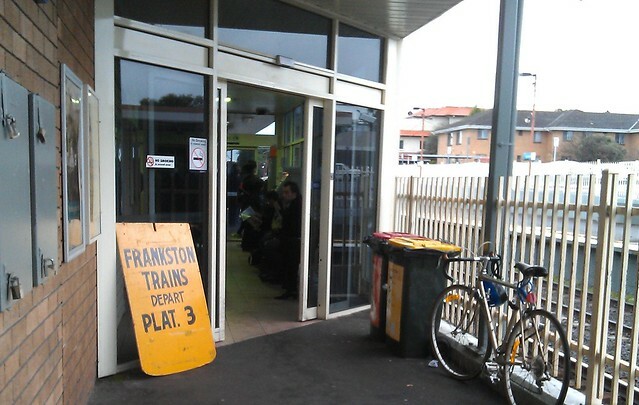 Most of my jobs since then have been in the CBD, so I’ve been a daily Frankston line commuter since about 2001. 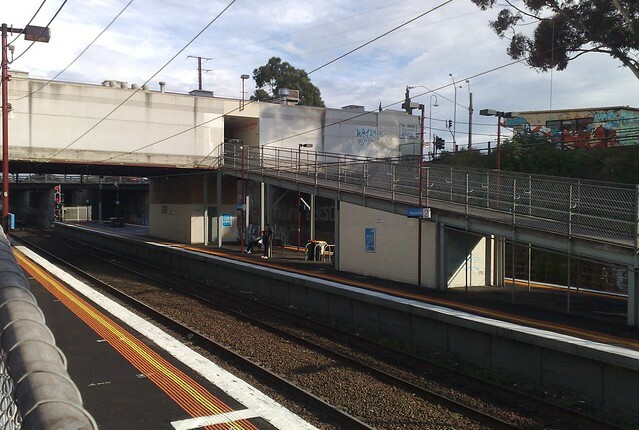 Glenhuntly station (which unlike the official suburb name, does not have a space in it) hasn’t changed much over that time (though I recall earlier visits in the 80s when it still had railway gates instead of booms, pre third track). Initially there was a booking office lady who could sell tickets very fast when a train was approaching — but at times there was nobody present, and no way to buy a ticket. For a short time she wore a bright jacket and was showing people how to use Metcard, and then she was gone, leaving only the machines. 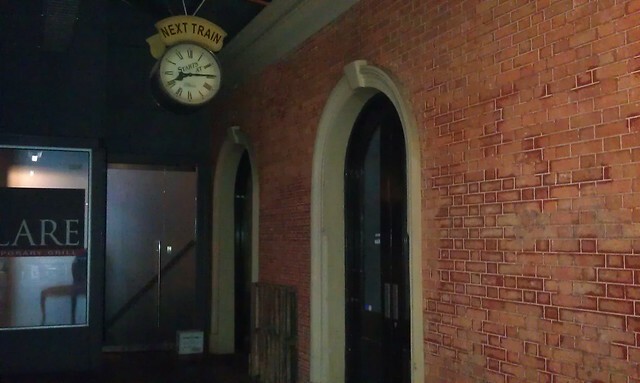 A coffee shop installed itself into the booking office at one stage, but then disappeared again. Nowadays there are station hosts present during morning peak only. I’ve written before about how the services through the station changed very little in the time I used it, while the operators changed from The Met/PTC to Bayside Trains to M>Train to Connex, then to Metro. It’s only in the past year or so that the timetables had a thorough re-write. 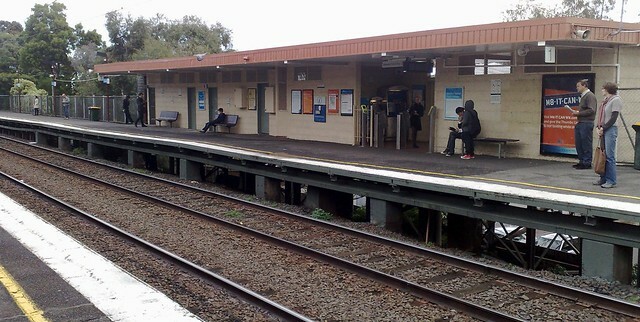 Even though I moved out of Glen Huntly in 2003, I continued to use the station until 2009, because the kids went to school nearby, and it was generally the easiest station to use as part of the school run. As a result, even though the car park is full by about 8am, I got to know the best all-day street parking spots nearby. It’s not really that hard as long as you’re prepared for a five minute walk. 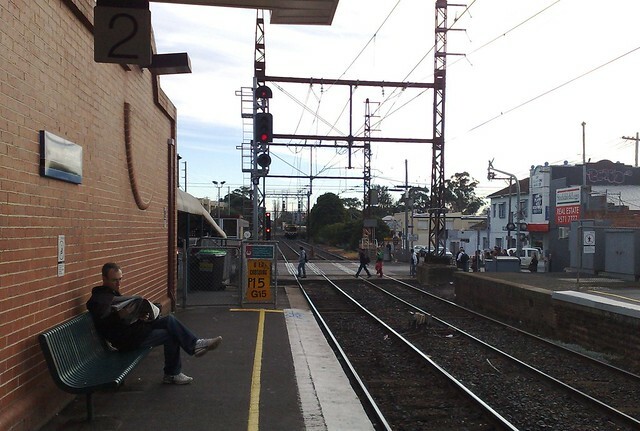 We moved into a flat just across the street from the Dandenong line. The noise isn’t noticeable after a week or two, apart from missing dialogue on the television when a freight train goes past. 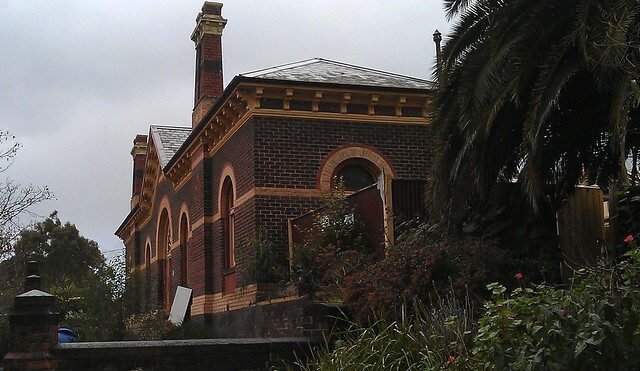 It was a short stroll (if one took the short-cut along the train line) to Murrumbeena station. 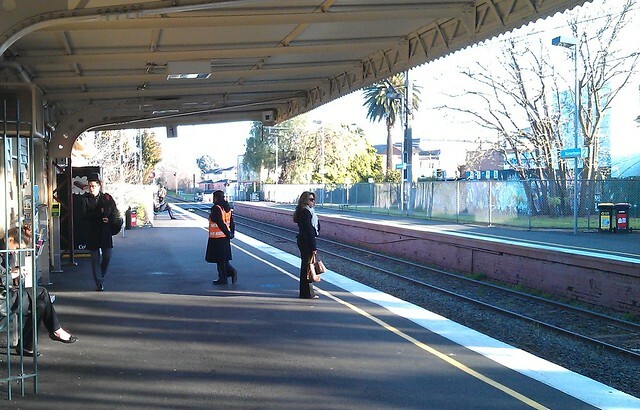 By year 11 I’d regularly meet school mates in the back of the 7:40am stopper from Oakleigh to South Yarra. 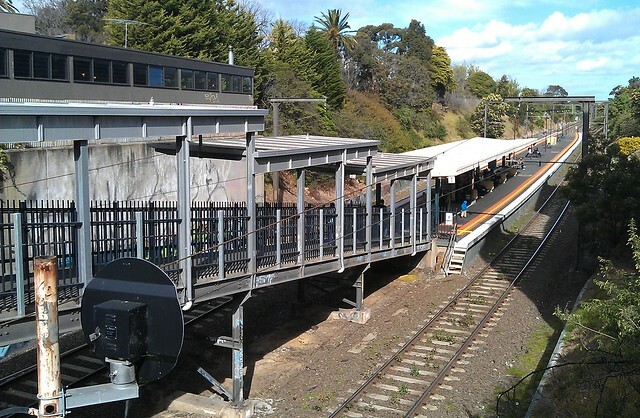 When I moved to university (at Caulfield, then called Chisholm Institute of Technology, but soon to become Monash University’s Caulfield Campus) it was a quick two-station trip. The station has barely changed at all. The staff member who used to be behind glass in the booking office is now out on the platform, but outside morning peak hours there’s nobody there at all. We moved to Hampton, but it was actually slightly closer to Moorabbin station, which I used for getting to/from the city, and to university at Caulfield. I think I timed the walk to the station at 12 minutes if going at speed, and looking for a gap in the traffic on the Nepean Highway, rather than having to wait for the lights. Not sure that’d be a good idea these days; I’m sure the traffic is heavier. 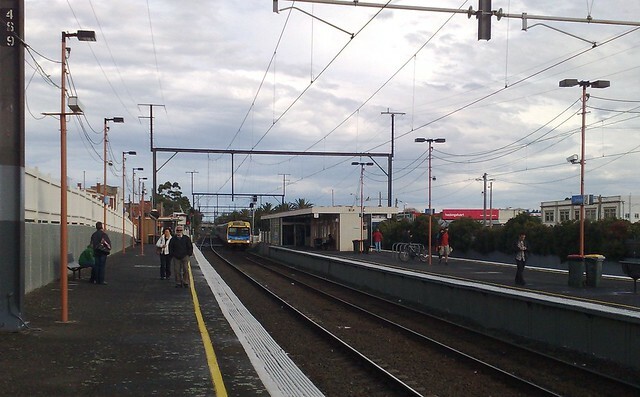 At times one could catch an express train from Moorabbin to Caulfield or vice versa. A good quick trip, but it seemed slightly unjust to be paying a two-zone fare for the privilege. Moorabbin station hasn’t changed much over the years — it’s still ugly — though after I moved away, the station building burnt down and was replaced by something that to my mind is about the same — at least, it’s the same shape, perhaps it’s a different version of dull civic building style/colour. Curiously, the Metcard validators are at the top of the ramps, but the Myki readers are at the bottom. Hampton station was my other regular, because I’d had the job in Elsternwick at Hattams for some years, and would catch the bus to Hampton then the train to Elsternwick to work there — on Saturday mornings, on Fridays once I started university (where generally it was possible to organise your timetable to have a 4-day week) and also during the holidays. 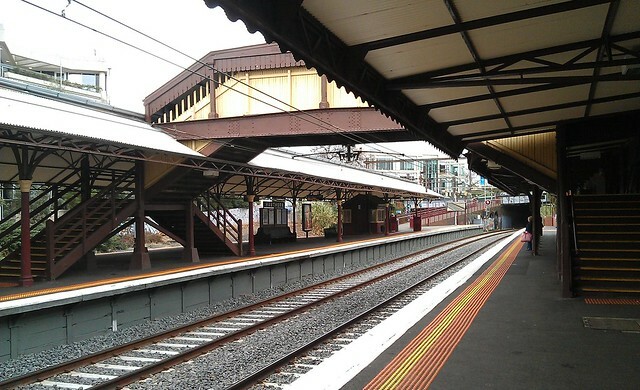 By 1993 I was in the workforce, and for a while was working in Burwood East/Box Hill South, and the commute was a bit of a killer, involving a walk to Moorabbin, a train to Richmond, then either a train to Box Hill and a bus to work, or a train to Burwood and a tram to work. I did get a fair bit of reading done though, and on the way home often had my mate Brian’s company, as he worked at the same place. When I was a baby, my parents moved into a flat in Fitzroy Street. That part of St Kilda might be hipster grungy now, but I suspect it was a bit of a dive back then. I was too young to remember it, and I don’t think we stayed there very long — but I do remember that later on we were still friends with Mrs Rice, who with her family lived in an enormous house in one of the side streets. Must be worth an absolute bomb now. My parents moved to a house in Napier Place, South Melbourne for a while, and its there I have my first memories (such as someone’s dog stealing a piece of meat I’d been given as a snack). This old photo was taken at Albert Park, I think. My mum still goes to a dentist nearby. In later years I remember her telling me that in South Melbourne in the early 70s, renovators were going through ripping out all the “ugly” lace ironwork in the Victorian terrace houses. By the 80s they’d realised it was a mistake, and were putting it all back in again, often having to resort to reproductions because the originals were long gone. 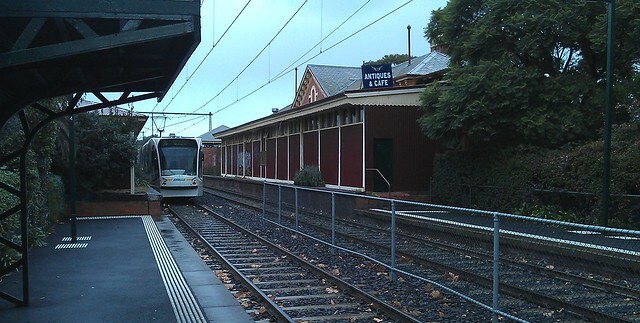 As with St Kilda, the station is now a lightrail stop, and the building is used by a local business. 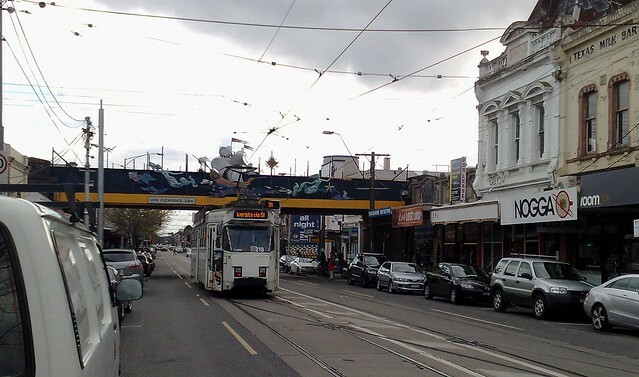 The level crossing still exists, with approaching trams given a green light (sometimes a little too slowly, it seems, forcing them to drop speed slightly to cross the road). For a while my parents moved across town. I suppose had they stayed there, I’d be a north-of-the-river boy, but as it turns out it was only a brief migration. We rented a house in Hutton Street, Thornbury, very conveniently located to the station. I seem to recall the house had a huge, jungle-like back yard, and I remember my mum using wringer (mangle) to dry the clothes after washing. It was at this house that, I am told, I instructed my sister to jump out the window (and she did), I dropped an egg and was told to say sorry (so I did, proclaiming: “Sorry, egg.”) and also that my sister dropped a biscuit down the drain and tried to reach down after it, becoming stuck.